Photo by *Visual Noise from the Torontoist Flickr Pool. ART: Communication | Environment, part of Luminato, features a series of eye-popping installations with the common theme of contemporary communications. 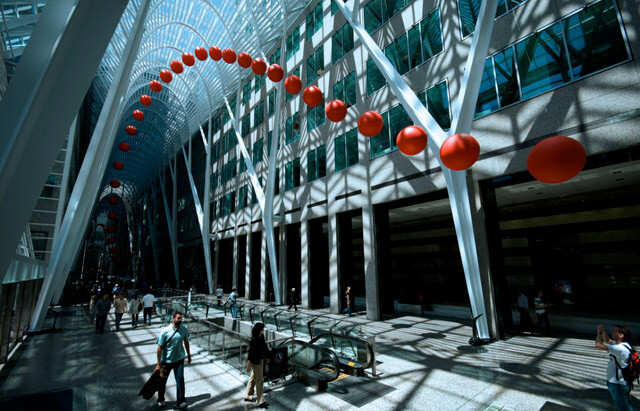 Among them is David Rokeby’s installation at the Allen Lambert Galleria, which features sixty-four spheres suspended along the atrium in the form of a modified sine wave (the basic structure of wireless communication). Allen Lambert Galleria (181 Bay Street), all day, FREE. FILM: The Canadian Cinema in Revue, curated by critic and filmmaker Alan Bacchus, highlights Canuck features and short films throughout the summer. The series launches tonight with Vincenzo Natali’s existential sci-fi flick, Cube, preceded by his short film Elevated. Cube follows six people who wake up in prison garb–style clothes and who find themselves trapped in a maze of booby-trapped cubes. Co-writer Andre Bijelic will be in attendance for the Q&A, and Natali will answer questions from Los Angeles via Skype. The Revue Cinema (400 Roncesvalles Avenue), 7 p.m., $8 for members, $10 for non-members. LECTURE: Toronto’s quirky, anything-goes mini-lecture series Trampoline Hall is back for its June edition. The talks, given by laypeople with no particular expertise in their chosen subject matter, make for a self-deprecating and thought-provoking evening. Tonight, the Globe and Mail’s Lisan Jutras examines the idea of embarrassment in “Puking Up Your Demons,” Noah Goodbaum tells us “How to Hold It Down When We’re Fucked up in the Game,” and Derek McCormack lectures on an unannounced topic. Sneaky Dee’s (431 College Street), doors open at 7:30 p.m., show at 8 p.m., rush tickets can be bought from 6:30 p.m. for $5. LECTURE: If you are, however, looking for a specialized lecture by a bona fide industry expert, catch the one by film theorist and Yale University professor Dudley Andrew. He’ll be delivering daily talks from today until Thursday on the aesthetics and theory of French critic André Bazin. The lectures are part of York University’s inaugural Summer Institute in Film, and they complement a graduate-level course on the relationship between cinema and time. Everyone is welcome. Nat Taylor Cinema, North 102 Ross Building, York University (4700 Keele Street), 2:30 p.m., FREE. WORDS: Tightrope Books is launching two books about the female experience: Heather J Wood’s novel, Fortune Cookie, and Moira MacDougall’s poetry collection, Bone Dream. Set in Montreal in 1989, Fortune Cookie is a diary-style novella that recounts a young protagonist’s hapless wanderings during a momentous year of political and social change. Bone Dream is a sensuous book of poetry that captures life through bodily imagery and everyday artefacts. The writers will read from their works at tonight’s launch, and the Devah Quartet will provide a classical cabaret performance. The Boulevard Café (161 Harbord Street), 7 p.m., FREE. CORRECTION: JUNE 8, 2009 Belgian arts collective Lab[au]‘s interactive work, Binary Waves, on Bay Street at Commerce Court—which we originally featured as today’s lead item, along with long wave—is at least temporarily offline due to some concerns regarding its electrical wiring. The electricity-free long wave installation is decidedly still there, however, and our recommendation to go see it still stands. CORRECTION: JUNE 8, 2009 The prices for tonight’s Canadian Cinema in Revue event were incorrectly listed as the same as the Revue’s regular pricing, but the screening is a special event, with different prices: admission is $8 for members (rather than $6.50) and $10 for non-members (rather than $12.50).